Thomas Dwan aka Tom Dwan aka Tom Dwan “durrrr” or simply “durrrr” (chosen as a nick to maximize his opponent’s tendency to tilt) as he’s known to the online poker scene is one of most popular young poker players around belonging to the group of poker stars including Gus Hansen, Phil Ivey, Doyle Brunson, Phil Ivey and the rest of the pack. Durrrr plays hyper aggressively and is extremely skilled in reading his opponent’s hands. He will regularly fold second nuts if he thinks he’s beat and gladly call immense pots with only high cards if he thinks he’s ahead. Thomas Dwan was born on July 30th 1986 in Edison New Jersey and in his short poker career he has managed to build his poker bankroll to a level where he is able to participate in the highest limit online games on Full Tilt poker and all the major live tournaments. In the following article I will sum up how Tom Dwan durrrr built his poker bankroll and mention some of the major pots and challenges he has been involved in. [adrotate group=”6″]As a kid durrrr played all the classical American sports such as basketball and baseball on a recreational / hobby level. He also enjoyed playing various card games with his family. His passion for poker started one day at his house where he and some friends played a 5$ buyin No Limit Hold’em. Fascinated by the game they quickly started playing sit and goes. Soon after, Dwan, aged 17, convinced his father to deposit 50$ on Paradise Poker and an online legend was born. After dropping to 15$ durrrr never looked back and within the first year he built his bankroll to 10000$ mainly from No Limit cash games. Throughout these early days, durrrr’s poker bankroll went through some major swings that were dealt with by grinding through lower limits. 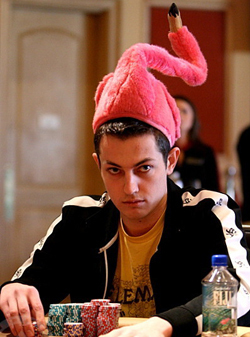 In 2006, Tom Dwan durrrr’s poker bankroll was large enough to buy a house in Fort Worth, Texas together with his long time friend David “Raptor” Benefield. In 2010 Durrrr’s bankroll has already been through several million $ swings but overall the numbers are black so far. During the 4th season of Full Tilt Poker’s Million Dollar Cash Game, Tom Dwan Durrrr won the biggest pot in TV poker history taking a whopping 1.1 million against Phil Ivey. [adrotate group=”6″]In January 2009 Tom proclaimed his million $ challenge in which he challenges any poker player except Phil Galford heads up at 4 tables over 50000 hands at the 200$/400$ or higher No Limit Texas Hold’em or Pot Limit Omaha. If durrrs wins he receives 500000$ in addition to his winnings and if he loses, his opponent receives 1,5 million $. So far Patrick Antonius and Daniel “jungleman12″ Cates have taken up the challenge, but neither match has been finished. In the 2010 World series of poker, Tom Dwan allegedly made side bets of over 5 million $ at odds 3.25:1 that he would win a bracelet. He came close losing heads up to Simon Watt in WSOP’s event # 11, $1,500 buy-in No Limit Hold’em. After the match Mike “The mouth” Matusow thanked Watt for saving numerous players millions of dollars. It will be interesting to follow the development of Tom Dwan durrrr’s poker bankroll in the remainder of 2010. 4 Comments to How did Tom Dwan “durrrr” build his poker bankroll? Also, you failed to mention his beginning at the S&G level before he played the cash games…or his win rates at either. Do you know anything about this period of his poker career including his win rates? I think that many beginning players would like to compare these stats with there own play.